In 1939, the five property owners of the 650-acre Honey Hollow Watershed united to protect the viability of their farmland. 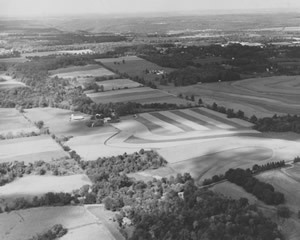 Their efforts were aided by the Soil Conservation Service (US Department of Agriculture) in Upper Darby, PA. By 1941 terraces and diversion ditches were built to control runoff on steep slopes and hedges were planted to control erosion. Their successful experiments in contour plowing and other soil and water conservation techniques served as examples for farmers around the country. This was the first agricultural area in a small watershed to show the benefits of soil, water, and wildlife conservation. Conservation education programs continue today through the Honey Hollow Environmental Education Center. Included are the families of Forrest Crooks, Francis Fitting, Alston Waring, Samuel Hopps, and Charles Wendig. Their efforts to protect their farmland were recognized nationally in 1969 when the US Department of the Interior designated the watershed as a National Historic Landmark, the only agricultural landmark in the nation. For more information, you can read the book The Story of Honey Hollow and the Origins of the Conservation Movement in Pennsylvania, written by P. Alston Waring, one of these property owners.